You never have the right of way. You can only yield the right of way. Learning to drive is a good example of a complex skill (the kind van Merrienboër and Kirschner grappled with in Ten Steps to Complex Learning). We tend to think we know what the outcome of the education or training will be: a good driver. And if your out-of-state license expired a year ago, you have to take “the knowledge and skills tests,” which I take to mean a road test and what was once known as a written test. I’ve been driving for more than 40 years and have had licenses in four states, but I don’t recall taking more than one road test. Not that I’m eager to do so, but you do get the impression that if you pass it once, still drive, and haven’t lost your license, you’re doing okay. Some of what vM&K would call constituent skills for driving are recurrent ones–how to start the car, how to stop, how to steer, how to recognize signals and respond to them. But there are many non-recurrent skills (things we do differently in each situation). The other day I was exiting a strip-mall parking lot, wanting to turn right onto the highway. An oncoming car on that highway had its right turn signal on. Did that mean he’d be turning into the lot I was exiting? How could I tell? How could I help a novice driver figure that out? My old instructor’s advice about right of way was a kind schema or mental model, like the two-second rule–one way to help new learners acquire cognitive strategies. In writing about this, I’m seeing more clearly that there’s also an overlap of stakeholders: the general public (represented by the state) wants the roads to be safe; new drivers want to be able to drive; parents want their children to drive safely. 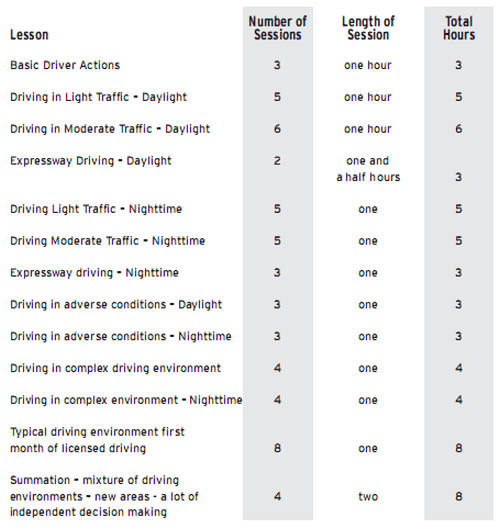 Maryland’s Motor Vehicle Adminstration publishes a skills log and practice guide “to help the new drives gain valuable experience in operating a motor vehicle in a variety of conditions and highway environments.” Maryland now requires 60 hours of supervised driving prior to taking the tests, with 10 of those hours at night. The parent, guardian, or mentor of the new driver must sign a statement attesting to this, in addition to the 6 hours of behind-the-wheel instruction in the mandatory driver education course. I like the guide (other than the mid-60s bureaucratic tone of the writing). A “planning guide” (on the right; click for a larger version) summarizes skills; individual sections amplify them with descriptions, examples, and checklists. Because of the state’s interest in having competent drivers, it makes sense for the state to have created this. Is 60 hours the right amount? Are these skills the right skills? Will parents or guardians follow the guide, or simply certify that they had? I had a look at the UK ‘advanced driving’ certificate once. You got cheaper insurance with some providers. And it was an advantage for some jobs, apparently. It was also fairly macho. It was interesting how most of the course was structured towards better driving – whilst at high speeds. I was unclear whose benefit this would be for. I guess we’re all called on to work in situations where the various stakeholders’ viewpoints aren’t perfectly aligned. And with people who are never going to give it the fabled 10k hours and achieve true mastery – driving is a great example of how the world is able to change much faster than anybody is capable of learning. When do people in Maryland have to retake the test? In the UK, it’s age 70. My grandfather saw this as a great injustice. But I was amazed that he passed and my parents wouldn’t let me in the car with him. I’m not sure when or even if people with Maryland licenses have to retake the road test (actually drive a car and get graded), or the written test (knowledge of driving rules). Vision test is once every five years. Driving feels like a right, especially with the once-qualified approach. And in most of North America, it’s so closely tied to mobility, freedom of choice, ability to hold a job. I remember being speechless at the poor test design (“I don’t know what the fine is! Drunk driving bad! Drunk driving *BAD*.”), but it gave me fine example whenever I teach about test design. Excellent example, Julie. I remember (vaguely) studying how far away to park from a fire hydrant. My answer today: far. I should make clear that I don’t necessarily think a road test is the answer to checking the ability of someone who’s been driving a while. I’m not sure quite what the problem is that the test would be trying to address. Right now, though, the default is: unless you’ve racked up enough violations to lose your license, you can keep it. Sort of like a doctorate. I did my driving test prior to the current Theory Test. In my day, you did your driving and then the tester guy asked you a couple of random questions. Mine was: which way do you steer into a skid? After a couple of uncomfortable moments, the tester guy said: fair enough, congratulations Mr Bostock. I asked him about the answer to this question which, apparently, was ‘into it’. A friend of mine received feedback on her test along these lines: you’ve done everything right and made no mistakes. I just don’t think you’re ready. She agreed and retook the test later. I’m not sure this would be possible today. Found myself thinking about this post a lot yesterday. It’s an interesting baseline for ‘accreditation’ and ‘compulsory’ training type conversations with clients. Thanks. Simon, I’m glad you mentioned those last two items. They were lingering in a nearby cognitive room, and maybe deserve their own post here. Whether that’s as reward or punishment, who can say? Accreditation strikes me as often an expedient middle ground between “this is The Way” and “not bad.” Physicians get MDs, lawyers are admitted to the bar, hairdressers get licenses (as do physicians, come to think), and all these things in theory represent some sort of attestation of competence. Sometimes there’s a flip effect, though, and the floor (minimum qualifying level) becomes the ceiling (see also “tenure”). Periodic in-service training / professional development is supposed to overcome that.